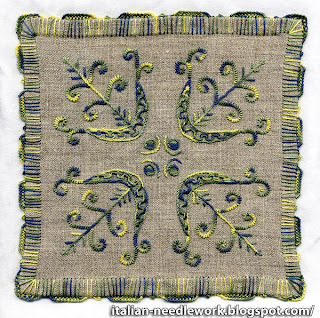 Way back in this post, I promised to let you know how my experiments with Umbrian Embroidery went. Recently I finally had some time to dedicate to some more experiments. As usual with my experiments, I learned more about what I shouldn't do than what I should, but I show them to you in the spirit of learning. Instead of using an evenweave fabric, I wanted a more rustic look and chose some lightweight undyed hemp fabric. I made sure to finish the edges on the serger before washing it, and after ironing the whole yard, I discovered that it had not been cut very evenly so I spent quite a bit of time withdrawing threads on the two sides that did not have a selvedge and then serging those two sides again for a more true idea of how much fabric I had (which was a yard in the end). I really like the look and feel of the hemp fabric. Ok, so now having squared-off my fabric I had some scraps to experiment on. I already knew that I wanted to use the varigated Anchor pearl cotton, 1355 which is a green/blue/yellow combination. But which weight? No. 5 or No. 8? While I really like the raised texture of the no. 5, it is clearly too heavy to use on this fabric, so no. 8 it is. 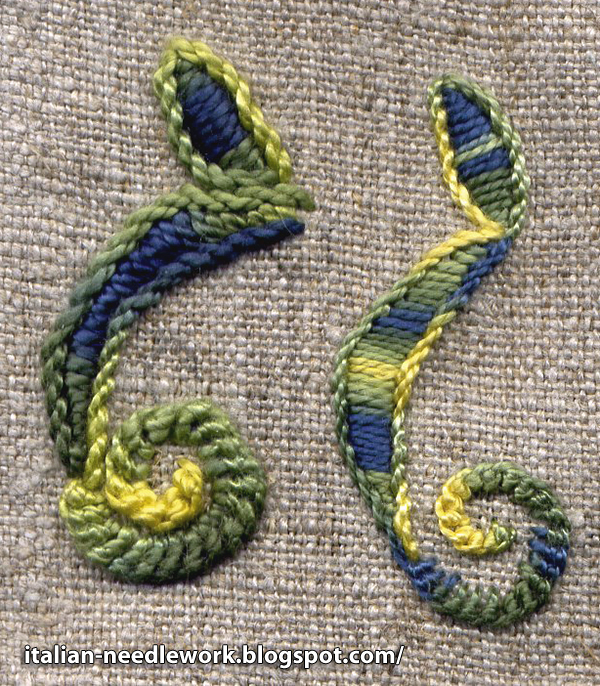 This little motif uses the Satin stitch, Stem stitch and the Ricciolino stitch which characterizes Umbrian Embroidery. Off we go! 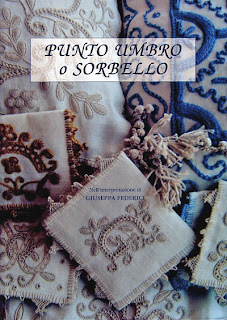 I chose a motif from Giuseppa Federici's lovely book: Punto Umbro o Punto Sorbello which I got last year at the Italia Invita Forum in Parma. I have been dying to try some of the beautiful things in this book. 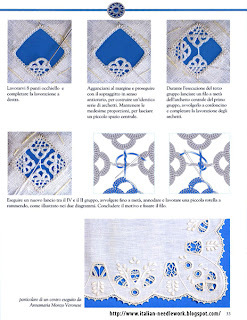 Giusy has written several books on different Italian needlework techniques and she really knows how to lay out a technical manual. The photos are clear and close-up and there are lots and lots of interesting and attractive patterns to try, all with photos of the items stitched up so you know what the end result will be. I chose one of the simpler Umbrian Embroidery motifs, transfered the pattern onto the hemp fabric and went to work. It stitches up quickly and while I love tone-on-tone, this thread produces an interesting effect too. Now, here's where I took a wrong turn... I am much more comfortable with counted thread embroidery and have a very hard time ignoring the weave of the fabric when doing free-style embroidery. Of course non-evenweave fabrics do not behave like evenweave fabrics and I should have calculated better before beginning my edging. I really like the edging I experimented with before in this post. I thought I had it all figured out with regard to joining the insertion stitches when connecting two pieces of fabric, and so, when I stitched along my first side of the square of fabric, I assumed that if my stitches were done the same on all four sides, the results would be the same. I tried to execute the edging stitches every three ground fabric threads, thinking (erroneously) that everything would work out. But warp and weft of this fabric are not the same. Can you see my difficulties? This piece will never match up with another one evenly and I even have five motifs on one side instead of four like the rest! All four sides are different. Giusy says in her book that you need to set the pattern for the edging with your first piece so that you can easily join the others together. This makes sense, of course but how to go about it? Even if I fold my square over so that the two sides with four motifs are aligned, the motifs are not positioned correctly to be matched up. This obviously cannot be done by counting ground threads (which I should have known) but rather with a ruler. If you have other ideas, please post them below! Now I will unpick the three edges which I don't like and attempt to make the new ones match the one edge that I do like which, ironically is the first edge I stitched. I should have paid more attention!! I'll let you know how it goes, hopefully it won't take me so long to get back to you this time! 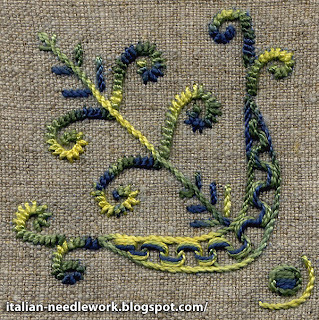 A very refreshing and colourful approach to an ancient Italian traditional needlework technique! 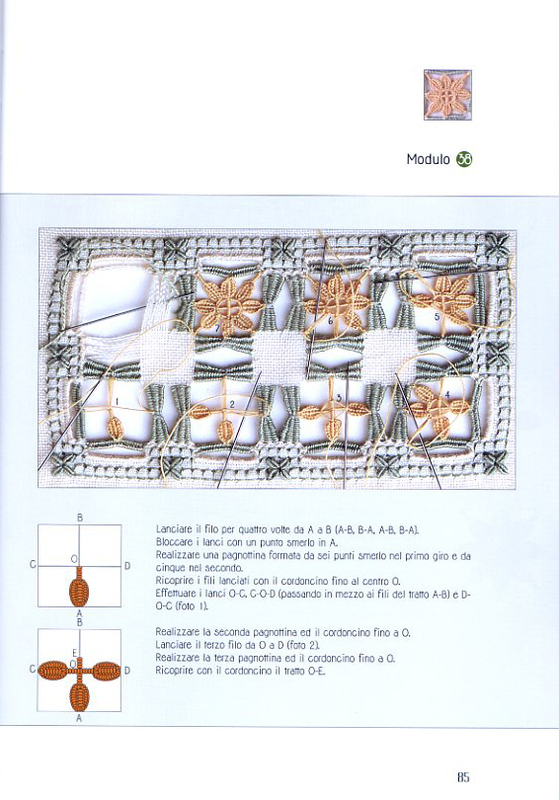 This new book by Paola Barbieri, published by the Associazione Il Punto Antico is a delightful Reticello manual. There are step-by-step photos and good diagrams as well as works in varying stages of progress to show you what your Reticello work should look like as you go. Sample page showing a work in varying stages of completion. There are 11 different delicious projects and countless filling stitches explained. The book has 96 pages and you can request a French or English insert when you order but the text in the book is only in Italian. The translation inserts will not be ready until September but they will be sent separately to those who would like them. The Associazione Il Punto Antico always has good English translations in their books. You can purchase Il Reticello interpretato da Paola Barbieri directly from the Edizioni Il Punto Antico website with PayPal or a credit card. I just have to re-direct you over to Silvia's blog Dentelles d'Abord for lots of links to old films on YouTube on lace and embroidery from the 1920s, '30s, '40s and '50s!!!!! Thanks so much Silvia for discovering these! Most days, 50% or more of my readers come from Italy. I find this odd as I started this blog with the idea of exposing "English-speaking" embroiderers (read: outside of Italy) to the wonders of Italian needlework. Right from the beginning however, at least half the readership has always been from Italy. Why am I telling you this? Well, today we're going to walk on the fine-line of subject matter. 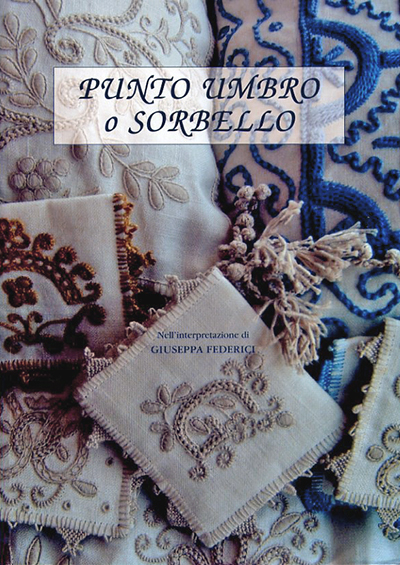 I want to tell you about a new book that is about needlework and is written by Italians but it is not "technically" Italian needlework if you want to be black and white about it. Hedebo Embroidery originally comes from Denmark. 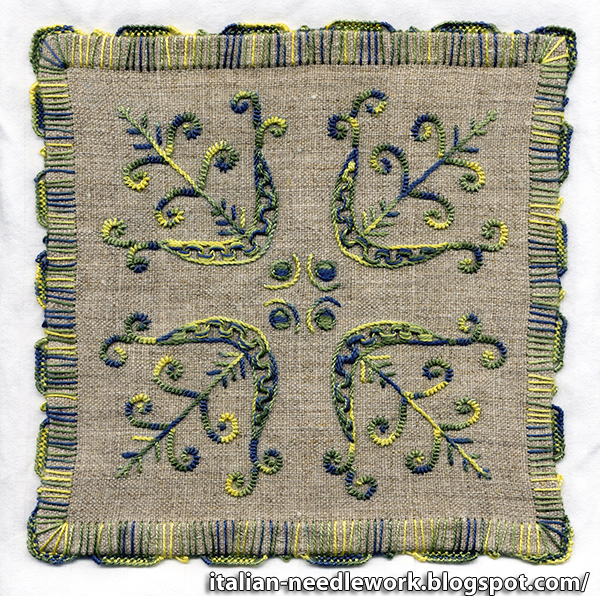 There are, however a lot of elements of Hedebo Embroidery found in Italian whitework embroidery and I have many times seen absolutely amazing pieces in museums, the work of Italian embroiderers. 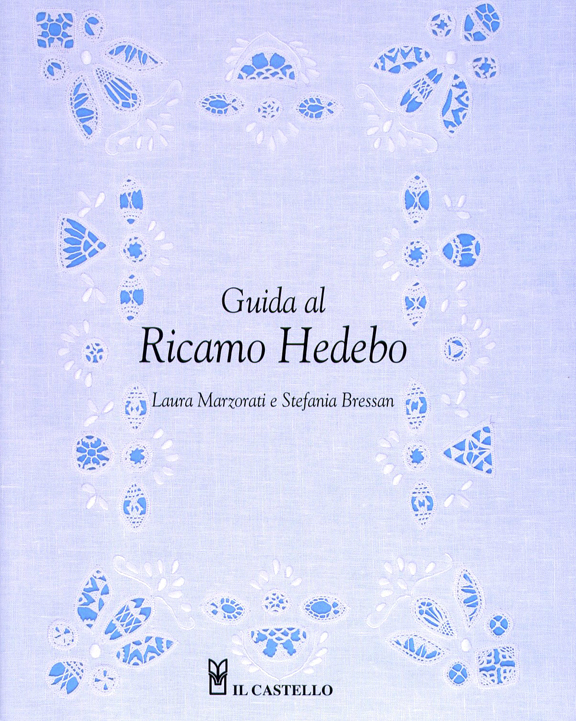 Guida al Ricamo Hedebo by Laura Marzorati and Stefania Bressan is a very good book and I don't see why I can't tell you about it. 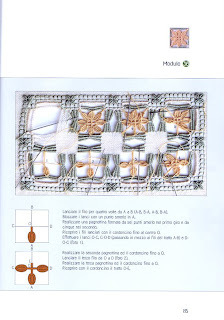 The authors are talented Italian needleworkers and teachers and have a handful of other books on various embroidery and lace techniques written both separately and together. The collaboration of these two is fantastic for us the needleworkers as they both believe in exhaustive explanations and instructions. Step-by-step photos which are taken from close-up and are very clear are complimented by accurate and impressive computer illustrations. There are tips and tricks scattered throughout the text (in Italian) and photos of both antique and contemporary pieces of Italian Hedebo Embroidery. Sample page from Guida al Ricamo Hedebo. The preface is followed by a bit of history and definitions of what makes up Hedebo Embroidery along with the materials required. Next is a section on the basic stitches and then the basic motifs, nearly 30 in all! Three projects are proposed and then there is a useful bibliography. This soft-cover manual consists of 64 pages. 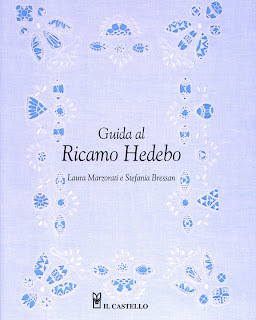 So, if you're not in Italy, I hope you don't mind that we've talked about Hedebo Embroidery with an Italian connection here today and if you are in Italy, I hope that I've helped you out! The other day, surfing around as one does, I stumbled upon a spectacular Flickr folder full of amazing works of art done in Pizzo Margarete. If you're looking for some eye candy, grab a cuppa and google "Pizzo Margarete" images! Here is my first attempt from Adriana Lazzardi's wonderful book: Macramè Il Pizzo Margarete. My technique needs a lot of work but it was fun to do and quick! I used some fine hemp yarn which gave me blisters on my hands so I will be looking for some cotton threads to use next time. The bookmark measures 12 inches long by 2 inches wide (at the widest motif). I made an error in not attaching the diamond shape together in the centre but at least I recognized it (as soon as I was finished of course!). I am not discouraged from trying again which is the important thing. 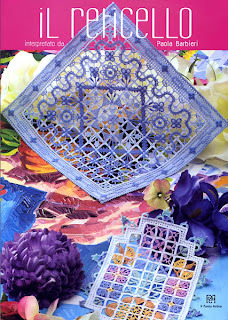 In the May/June 2012 issue of Piecework you will find a wonderful article and projects by Marji Suhm who learned this technique from two expert teachers in Germany where the technique (known in German as: Margaretenspitze [Margarete's lace]) was originally created by Margarete Naumann around the turn of the 20th century. I always love to see how Italians add their own flair and style to techniques and the Flickr folder mentioned above shows you some fantastic Italian creations in Pizzo Margarete.